The Daleville Chamber of Commerce" provides promotion, information, communication and encouragement to local businesses, with particular attention given to the economic, civic, commercial, cultural, industrial and educational interests of the area. 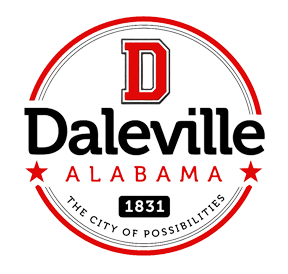 If you are interested in learning more about the Daleville Chamber of Commerce please visit them here. For new business licenses please contact Angelia Filmore between the hours of 8am-12pm and 1pm-5pm, Monday through Friday. (334) 598-2345. For license renewal go to revds.com or telephone 1-800-556-7274; choose options 1-6-1.